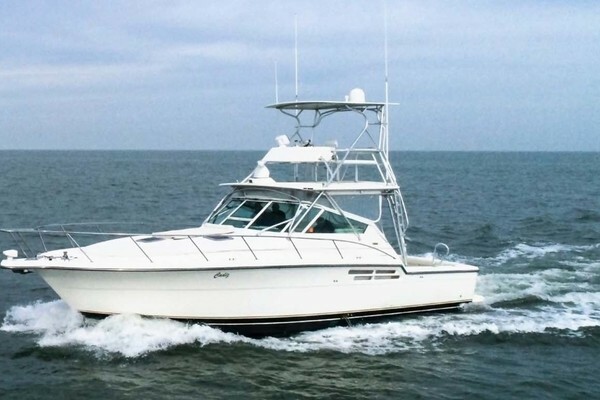 Tiara Yachts is one of the most popular cruising and fishing boat manufacturers that is in production today. 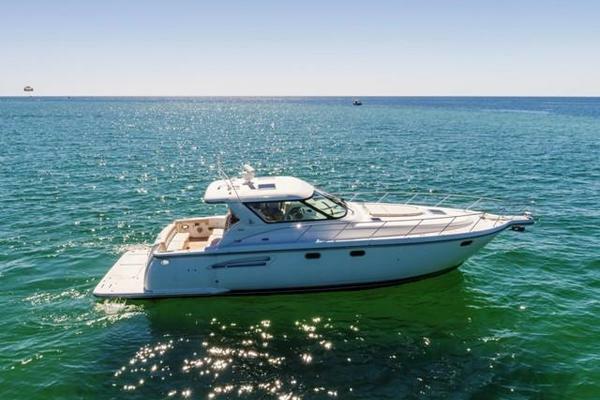 With a long tradition of building quality yachts out of their factory in Michigan that goes back over four decades, there are always a good selection of used Tiara Yachts on the market from which to choose. Dating back to 1946, Leon Slikkers came to start building 14’ runabouts in his garage which eventually led him to develop the name, Slickcraft – allowing him to start his own shop that let him experiment with fiberglass in the 50s. Soon on, Slikkers sold Slickcraft to the AMF Coporation and eventually developed new sailboats under S2 Yachts. Gradually, S2 then started producing high-quality powerboats, which led to the name Tiara – now one of the most respected names in the business. Tiara Yachts takes pride in their boat building skills, always wanting to improve the yachting experience for its owners and they achieved this goal by always providing innovation in their timeless designs, hardware, trims, and features. Partnering with the best engine manufactures and increasingly revolutionizing their features, storage areas, and functionality makes this brand always meet the standards of yachting enthusiast. Not only are these yachts a lasting investment for their owners, but also really exemplify the heart’s desire for an exhilarating thrill on the water. While delivering an adventurous feel for owners, the 5800 is known for its high efficiency, low noise levels, and extremely simple docking features. Bigger and better, this new model offers a large engine room with two big blowers, fantastic wiring support, triple IPS 600s, and enough stowage forward to fit even a few kayaks. Once aboard you can take a look inside the salon enclosed with massive windows, a windshield, and twin glass sliding doors that provide ample light throughout the space. An L-shaped settee and movable mahogany club chairs provide a formal seating area – perfect for a social soiree. Beyond the salon, you can find the helm deck, which sits distinctly forward. Luxurious details can be found in the helm station that sits starboard, including tongue-and-grove footrests, a leather wheel, and is even teak-topped. On the lower deck sits the galley, which sits beneath the windshield making it an atrium, connected to the dining area just steps down providing a great entertaining space. The master features a king berth, easy chair, and fixed hull allowing guests to feel the comforts of home while still being able to endure the excitement on the sea. This solid model is just another example of Tiara’s unwavering commitment to its owners. Tiara has always been known to be a valuable resource for those who understand what it takes to enjoy their time on the water and the Tiara 50 Coupe is no exception to that rule. Making its debut at the Ft. Lauderdale boat show, the 50 is a 35-knot sport yacht characterized with her sloping lines and large hull-side windows – quite a step forward from the traditional Tiara profile. Her deck wings and swept sheer hold true to the brand-design features, while also having a contemporary interior with modular settees and angular door handles. Inside you will find hull-side windows, cabin skylights, sunroof, and a large windshield providing enough light throughout the cabin to make you feel as if you were outside. Being the first North American production yacht to inhibit the Volvo Penta’s Glass cockpit, the 50’ Coupe integrates state-of-the-art electronic systems with a plethora of navigation, engine, and mechanical information. The cockpit is connected to the galley, saloon, and helm deck with sliding glass doors having guests easily flow throughout the layout. The galley sitting forward, along with the salon and helm are “topside” under the top site. Flexible furnishings are placed throughout, like the electric table and convertible, as well as the movable ottoman-seats and retractable sunshade. 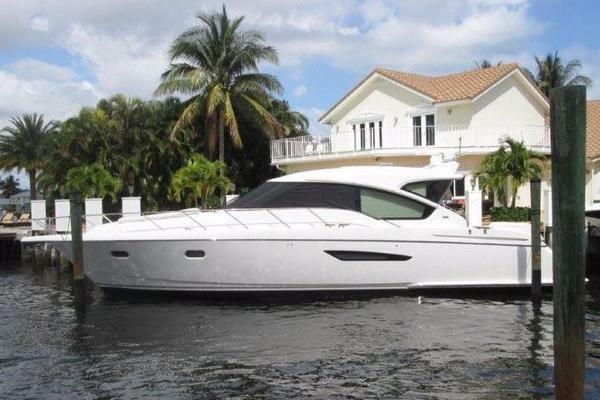 Confidence is the main feature of this model and delivers an assuring cruise for any boat goer. Built with power and durability, the 4500 Sovran is the second-largest build in the Sovran sports cruiser line. This noticeable vessel demonstrates all the top Tiara qualities and is no exception to their reputation for building comfortable and reliable yachts. Space is a key factor within this model, which first can be seen in its cockpit with ample stowage beneath the seating and an all-purpose table that flips up on hinges to create a spacious environment. Proving to be accommodating, the upper cockpit and helm area is particularly perfect for family living with its two-seat helm – suitable for a couples cruise. The interior within demonstrates Tiara’s obsession with customer satisfaction – built with teak-and-holly sole and a roomy, spacious master cabin located in the bow providing sufficient comfort. While cruising, this model does not disappoint with its remarkably quiet engines letting you converse with your guests comfortably at the helm. Cruising at 32 knots, the 4500 knives through the water elegantly making it suitable in any weather condition. Well designed for its intended use, the 4500 is quiet, athletic, and replete with features that should keep you and your family happy for years to come. Not only is this cruiser fun and responsive, but also exhibits the handling traits for which Tiara’s boats are known for. Featuring 4x6” vertical fiberglass beams running up the sides of the salon and across, the 44 Coupe was built for social gatherings by connecting the helm, saloon-galley, and cockpit on one level. Placing the galley up and aft provides a more central location for those wishing to entertain, while the aft cockpit and enclosed saloon surround the space providing an open and welcoming environment. 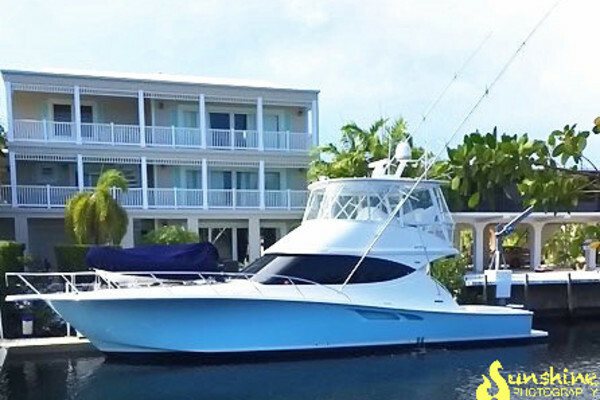 Additionally the cockpit sports a molded-in transom lounge with a table and steps to the side decks and aft to the swim port – suitable to hold a tender for a perfect day on the water. Designed for a cruising excursion, the yacht features a two-stateroom, two-head layout that provides homey details, while still providing comfort throughout. The main attraction, although, is the saloon, which includes a generous L-shaped settee and a starboard-side galley providing accessibility to all areas on the yacht maximizing the real estate on the boat. This ideal model is an outstanding addition to its fleet and has riding characteristics that won’t disappoint Tiara’s boat owners.